Rain, although it did delay the start, did not dampen the spirits of those who made the trek up Snake Mt. for the opening ceremony. Like a Phoenix rising from the ashes Javier (in Eagle regalia) offers wine back to the earth from which it comes. 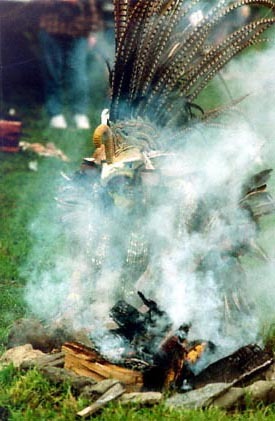 The symbolic ritual gives thanks to the earth for the gifts of life sustaining energy, offering it back and at the same time thanking the Creator for life itself. 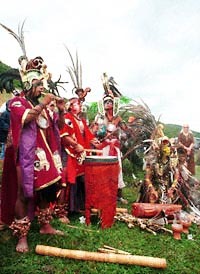 Unlike the misconceptions from first contact with most native cultures by representatives of the "civilized" world, these are not some pagan rituals; worshiping idols and animals and other falsehoods. 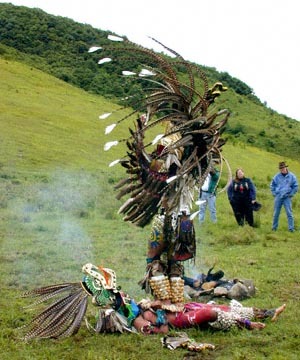 The Eagle Dance, performed away from houses and power lines and noise, is as beautiful as it is deeply symbolic. 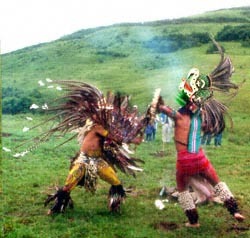 (right-the Serpent, symbolizing energy) do ritual battle. The Serpent is conquered but rises to join with the Eagle. 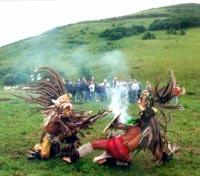 Together they form a union to protect the children of Mother Earth. Alarcon explained that he believes energy is inherent in nature. "The energy is there - you can use it for good; you can use it for bad," he said. "When I conquered the snake, I created a balance in the energy."